A number of studies provide information on lower Potomac aquifer permeability or hydraulic conductivity (Hansen, 1969, 1984; Trapp and others, 1984; Trapp, 1992; Leahy and Martin, 1993; Pope and Gordon, 1999). However, only Pope and Gordon (1999) provided a map showing distribution of hydraulic conductivity (transmissivity) for the eastern coastal plain, and it is used for the GIS. 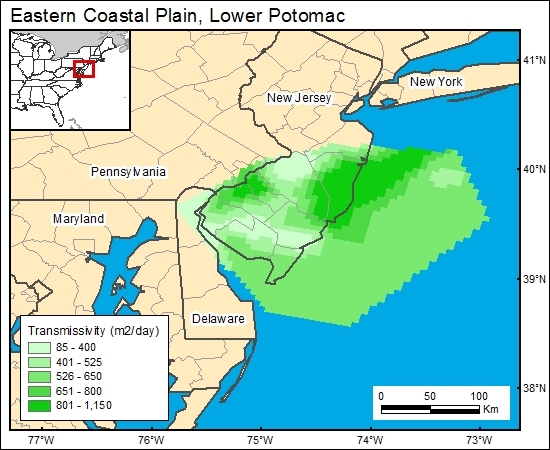 The Pope and Gordon (1999) map is limited to the New Jersey coastal plain, and so another data point available from the Waste Gate Formation of eastern Maryland (Hansen, 1984) is also included in the GIS.